Eurotech Racing’s Jack Goff has his feet firmly under the table having joined the squad over the off-season, and the High Wycombe racer heads to Brands Hatch this weekend with an air of confidence. Last season was something of a frustration for the 26-year-old. Were it not for a coming-together at Thruxton, Goff could have left Hampshire top of the pile in terms of the championship race. In fact, he garnered the most fastest laps of any driver in 2016 – no mean feat. The pace was evident but sometimes the rub of the green was not. “I think we were very unlucky last year,” said Goff. “If you look back, I think it was Thruxton, the third round of the championship where we had an incident with (Gordon) Shedden. If it wasn’t for that, we’d have come out of there leading the championship. “At Snetterton we had a problem in race two that meant we had to start at the back of the grid for race three so there’s another two races gone. At Oulton Park I had a problem on the grid too and at Rockingham I was taken out of two races through no fault of my own. Heading into 2017, Goff returns to front-wheel drive machinery at Eurotech Racing in the shape of its Honda Civic Type R. With a strong pre-season behind him, and plenty of time to settle into new surroundings, he heads to Brands Hatch in positive mood. “I know I’ve chopped and changed between front and rear-wheel drive in recent years,” continued Goff. “It was easier going back to front-wheel drive as it’s what I’ve raced most throughout my career, going back to the Clios and even before that. “With the RWD it was relatively unknown but with FWD it was there in the back of my mind so it’s been a bit easier. “I’ve slotted in straight away with Eurotech Racing. They’re a great bunch and I’m loving the car so it’s all looking quite positive at the moment. “If you’re feeling at ease with everyone around you then that makes life a lot easier. We have a bit of banter but we’re very focussed on the job which is to go out there and win races. 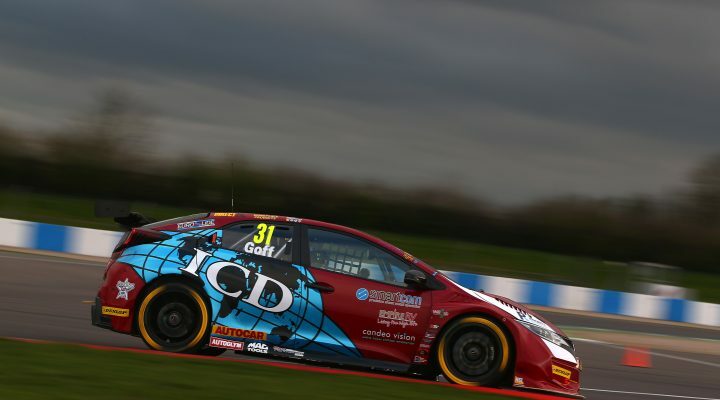 “We’re feeling quite confident heading to Brands Hatch. We know what we’re doing but we don’t know what everyone else has been doing. “We have different tyres this year to learn. The car ran last year in RML specification but we were running a slightly narrower tyre in 2016 so we’re learning things over again slightly though the guys are fantastic both in the engineering department and in the garage.